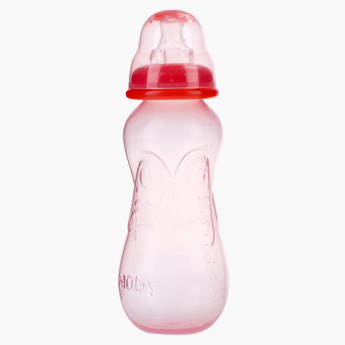 Nuby Non Drip Feeding Bottle - 300 ml | Pink | Bpa free. Get this unique shape bottle to feed your baby while travelling. This has good grip and is specially designed with the non-drip system. This bottle is Bpa free so it is safe to use. Feature 3 : Anticolic System. Teething nubs massage gently baby gums.